Private Charles Hedworth was born in Long Bennington, where he lived with his parents George (a farm labourer) and Sarah, and his brothers at Binghams Buildings. The family moved to Silk Willoughby then to Normanton (where they lived next to Charlie Spendlow’s uncle Isaac in 1911). After serving in the North Staffordshire Regiment, Charles ended up in 7th Battalion, Lincolnshire Regiment. 7th Lincs were in 51st Brigade, part of 17th (Northern) Division of the British 3rd Army. In October 1918, after the British success with tanks at Cambrai, the unit took part in the final advance in Picardy. In the early morning of 20th October the 3rd Army made a surprise night attack during the Battle of the Selle. Private Hedworth was died of wounds this day (aged 19 and only 22 days before the armistice) perhaps during the night attack. He was buried at Montay-Neuvilly Rd Cemetery, Pas de Calais. His name is on the war memorials at Normanton, Syston and Long Bennington. His oldest brother Cecil served in the 24th Battn, London Regiment, he was discharged in Sep 1918 as no longer fit for war service. 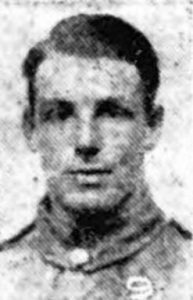 The next brother, Hedley served in the Royal Engineers but was honourably discharged in July 1918 due to sickness. His younger brother Horace was 16 in 1918, so too young for service in WW1.